OSU redshirt-sophomore wide receiver Michael Thomas (3) sprints away from Kent State defenders on his way to the end zone Sept.13 at Ohio Stadium. OSU won 66-0. The Ohio State football team moved on from its loss to Virginia Tech last week in emphatic fashion, defeating the Kent State Golden Flashes Saturday, 66-0. 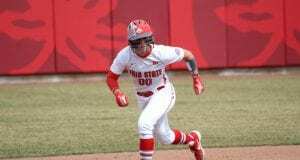 The blowout win allowed for multiple freshmen and young players to get playing time they would not normally get. 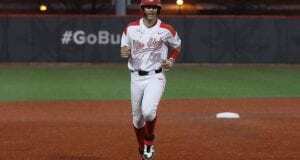 In fact, 23 redshirt and true freshmen took the field for the Buckeyes, something coach Urban Meyer said he wanted to take away from Saturday’s game. Even though he is a starter, J.T. Barrett qualified as one of those young players as Meyer said he wanted to see what his redshirt-freshman quarterback could do following the loss to Virginia Tech. Barrett, who tied the OSU single game passing touchdown record at six, said he feels as though he is improving with each game. Including the six scores, Barrett lived up to his “distributor” nickname as he completed passes to 11 different receivers and finished with 312 yards passing. Barrett became the first OSU quarterback to amass 300 passing yards in a game since Troy Smith did so in 2006. Senior wide receiver Devin Smith, who exploded for a 50 yard score from Barrett in the second quarter, said after the game that having a plethora of receivers makes the offense a more complete unit. Another one of those receivers was redshirt-sophomore Michael Thomas, whose 63-yard score in the first half ignited the crowd of 104,404 at Ohio Stadium. Thomas said following the game that the near-capacity crowd motivated him to elevate his play. Meyer said he also appreciated the crowd and echoed Thomas’ comments. Another one of those players was freshman linebacker Raekwon McMillan, who despite not starting led the team in tackles with seven total, including two sacks. 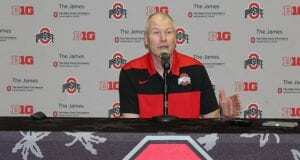 McMillan said post-game that he feels he is starting to settle into his role with the Buckeyes. Co-defensive coordinator and safeties coach Chris Ash said that even though young players got to see the field, his expectations for them are the same as veterans. The shutout marked the first time the Buckeyes have held an opponent scoreless since a 76-0 victory against Florida A&M last season. The Buckeyes are set for a bye week before taking on Cincinnati on Sept. 27 at 6 p.m. in Ohio Stadium. 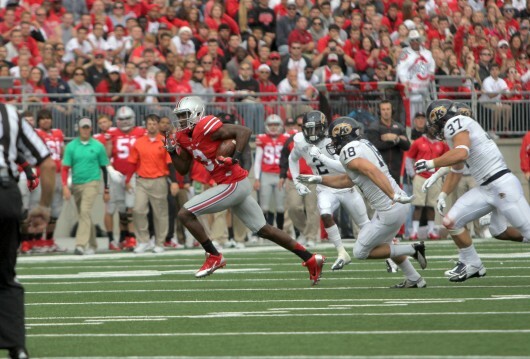 Watch Lantern TV’s highlight reel of the Ohio State v. Kent State game below.